With the aid of a black cane, junior business major Naji Nizam moved steadily toward President Samuel L. Stanley Jr.’s office. On his way into the building, one of the handicap-accessible doors leading inside started to close on top of him while he headed through the entrance. “This is exactly what we’re talking about,” Nizam, who was born with a rare neuromuscular condition, said. For Nizam, navigating academic life comes with an extra set of challenges. He moves more slowly than his able-bodied peers and has slipped on ice getting back to his car in a handicapped parking spot more than once. There have been occasions, particularly in poor weather, where Nizam has decided it’s easier to avoid class entirely rather than park in the back of a lot or use a ride service he considers humiliating. 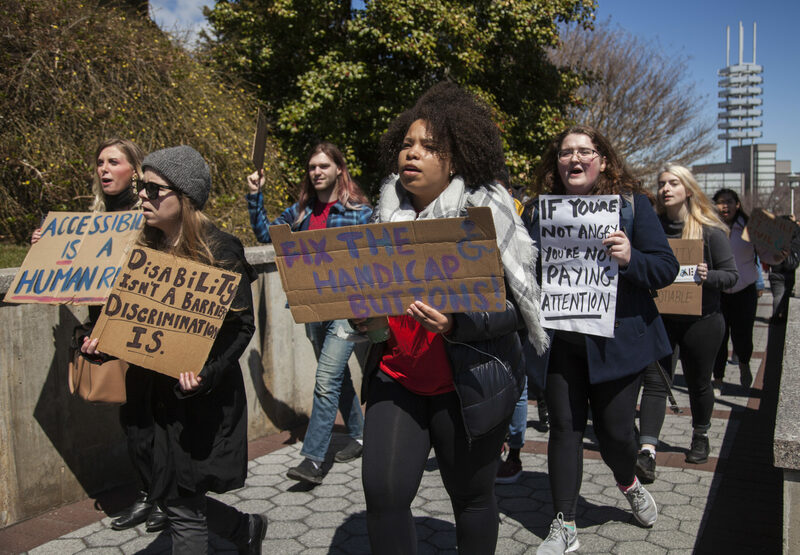 The march was organized by the Disability Rights Coalition (DRC), an impromptu alliance of campus activists led by Nizam and former Peer Mental Health Alliance (PMHA) president and Stony Brook alumna Allilsa Fernandez and co-sponsored by the Graduate Student Employees Union (GSEU). Stony Brook’s accessibility issues violate both the Americans with Disabilities Act (ADA) and its own policies, Fernandez said. As the demonstration died down, two of the march’s organizers, Nizam and Stony Brook alumna and CUNY master’s of public health student Jacqueline Albin, made their way into the Administration Building to try and speak directly with President Stanley. Albin was present to represent the DRC’s students with mental health issues. She was diagnosed with schizoaffective disorder and post traumatic stress disorder (PTSD) at the end of high school. Two months into her undergraduate career at Stony Brook, after being placed on medical leave and taken to the hospital, the school sent her a letter she said exacerbated her troubles. While she was ultimately able to return to Stony Brook, Albin felt some of her classmates feared disclosing their struggles with mental illness after hearing stories similar to her’s, and the campus’s ADA committee has failed to properly accommodate students with invisible disorders. When Albin and Nizam arrived at the entrance to President Stanley’s office, they were met by five university police officers. The officers explained they were unsure how many students would try to enter the office and prepared to face a mass of protesters clogging the halls similar to the March for Humanities two years prior. After a few moments, Assistant Dean of Students Jeffrey Barnett came to speak with Nizam about the issues he wanted to discuss. He was joined by Interim Chief Diversity Officer and Assistant Dean for Multicultural Affairs Jarvis Watson shortly afterward, who then spoke with Albin. The pair left the hallway around 20 minutes later, both agreeing the experience went well. “It was a three-hour trip to get here but I’d do it [again] in a heartbeat,” Albin said. Nizam walked away feeling the DRC was able to make substantial progress through the demonstration, and Barnett and Watson would be valuable allies for their cause.